‘The Maltese Falcon’ is one of those perfect films where everything came together at just the right moment to make magic. It was a hit with critics (“the first crime melodrama with finish, bang and speed to come along in what seems like ages”), and audiences, which surprised a lot of the studio brass. Dashiel Hammett’s detective novel had been filmed twice before; Warner Brothers felt they’d made their money on it and didn’t have high expectations of first-time director John Huston. But the cinema gods smiled upon the project, and the script, photography, performances and direction all clicked to make one of the smartest and most enjoyable detective films in Hollywood history. I wrote elsewhere on this site that I think ‘The Big Sleep’ is the most perfect detective noir ever made. It is, but I find ‘The Maltese Falcon’ a far more entertaining film. It has a much more intelligible plot than the Chandler story, a lean, taut script that doesn’t waste a moment, more interesting characters, more memorable lines, and is directed with wit and style. If I had to choose which Bogey detective I want to bring to a desert island, I’d pick Sam Spade over Philip Marlowe every time. But there is one crucial difference: Spade seems to enjoy his work a whole lot more. This may be simply because it was Humphrey Bogart’s first proper starring role, and he wanted to make the most of it. After years of playing villains and henchmen, he got to be the lead, and the good guy. It worked. The role firmly established the Bogey persona and his star status. He’s smart, tough, cynical, funny, and he has his own moral code. Bogart only got the part after George Raft turned it down. He didn’t want to work with a first-time director. Raft also turned down the role of Rick in ‘Casablanca’. Hollywood can be cruel when she’s been spurned not once, but twice: Raft died penniless in 1980. At several points in the ‘The Maltese Falcon’ Bogart smiles a little self-satisfied grin, clearly having a wonderful time playing one crook against the other. And with crooks like these, who can blame him? There is Brigid O’Shaughnessy, alias Miss Wonderly, who sets the whole plot in motion. She is played by a brittle Mary Astor. At first she comes across as coy, faltering and nervous: Huston made her run around the set before takes so she’d be breathless. When Spade cottons on to her real character, she relaxes, but only in the way a cobra might seem to relax while watching its prey. He still falls for her (but just a little – that’s another difference between Spade and Marlowe; Spade doesn’t seem to be as much of a relentless hound). O’Shaughnessy and Cairo both speak in mysterious tones about “the fat man”, Kasper Guttman (Sydney Greenstreet), who doesn’t show up till almost the third act. Guttman is the sort of villain you would like to have as a dinner guest. He has a rich, booming voice, an expansive manner and an irresistible gregarious charm. He chortles appreciatively at Spade’s clever tricks. He enjoys everything enormously. ‘Enormously’ is the best word: Greenstreet was well over three hundred pounds (Warner Brothers had to custom-tailor his suit, and Huston shoots him from low angles, so you simply can’t ignore his gut). It’s hard to believe that ‘The Maltese Falcon’ was Greenstreet’s film debut. He was 62 and a respected stage actor. Guttman is as equally verbose as Cairo, in spite of his stated fondness for plain-speaking. When he first meets Spade, he offers him a drink, and there follows a wonderful exchange. It has nothing to do with the plot; it is all about character. Guttman: You begin well, sir. I distrust a man who says ‘when’. He’s got to be careful not to drink too much, because he’s not to be trusted when he does. Well, sir, here’s to plain speaking and clear understanding. You’re a close-mouthed man? Spade: No, I like to talk. Guttman: Better and better. I distrust a close-mouthed man. He generally picks the wrong time to talk, and says the wrong things. Talking’s something you can’t do judiciously, unless you keep in practice. Now, sir, we’ll talk if you like. I tell you right out, I’m a man who likes talking to a man who likes to talk. Guttman is accompanied by a querulous hired gun, Wilmer (Elisha Cook, Jr.), a petty hood, a “gunsel”. Audiences thought that was just street-talk for “hoodlum”. It was, but it was also a derogatory word for a homosexual, and it’s clear that the relationship between Guttman and his bodyguard is complex. Listen to how Bogart snarls the word and you’ll appreciate how homophobic Spade is. 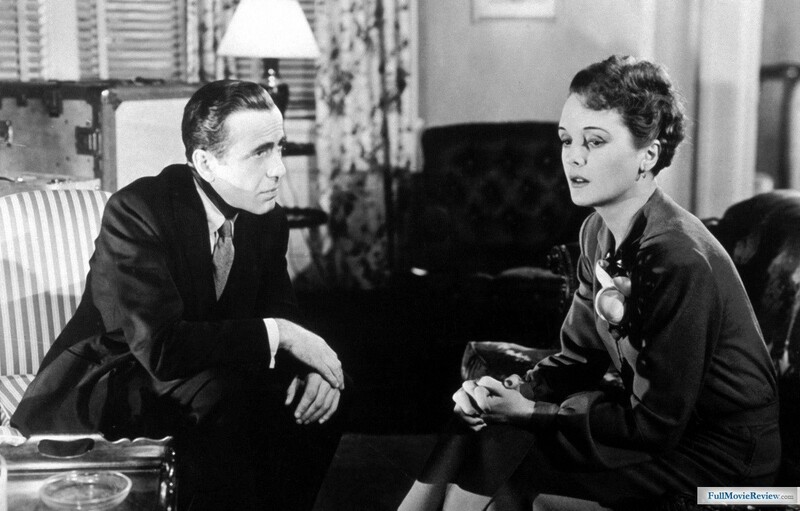 ‘The Maltese Falcon’ is a remarkably talky film. The dialogue has been lifted pretty much verbatim from Hammett’s novel. There is little “action” and there are in fact very few scenes. The final scene lasts more than twenty minutes, and within that there’s a seven-minute take (almost unheard-of at the time). Huston, who also wrote the screenplay, storyboarded every shot, and the result is an efficiently and thoughtfully directed film (something you can’t say about a lot of Huston’s later films.) There are a lot of low-angle shots that emphasise the claustrophobic atmosphere of the rooms. 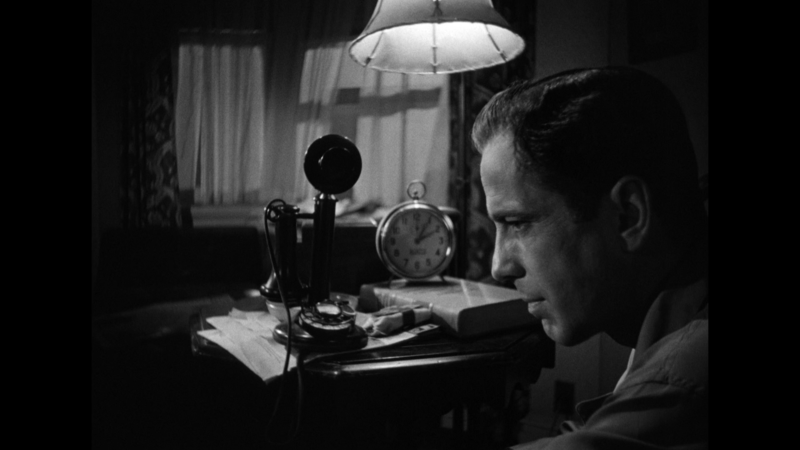 The camera is frequently just behind Bogart’s shoulder, so the audience can identify with him as he tries to solve the puzzle. And what is the puzzle? The murderous and double-crossing crooks are trying to get their hands on a priceless treasure, a gem-encrusted statue of a falcon that the Knights of Malta spirited out of the Holy Land during the Crusades. A lot of people die trying to get it, including Huston’s own father, Walter, who stumbles into Spade’s office and collapses. In the end, Bogart says of the statue – borrowing from Shakespeare – “it’s the stuff that dreams are made of.” He could just as easily have been speaking about ‘The Maltese Falcon’. I love old movies, I grew up on them back in the 60s when they were on TV all the time. But we still watch a lot of old Bogey movies whenever we DVR them. Just watched Key Largo again for the zillionth time last week. Forgot what a flawless script and how perfectly acted it was (by the principles. some of the secondary actors overplayed it a little) Edward G. was incredible. Still after all these decades his act sells. But then two nights ago we watched White Heat with James Cagney. A little too straight ahead of a script but it had its incredible moments. When Cagney learns of his mother’s death in prison. WOW. Cagney was a tremendous actor. Anyway. Cool blog. I’ll be back! You are talking my language here Niall. 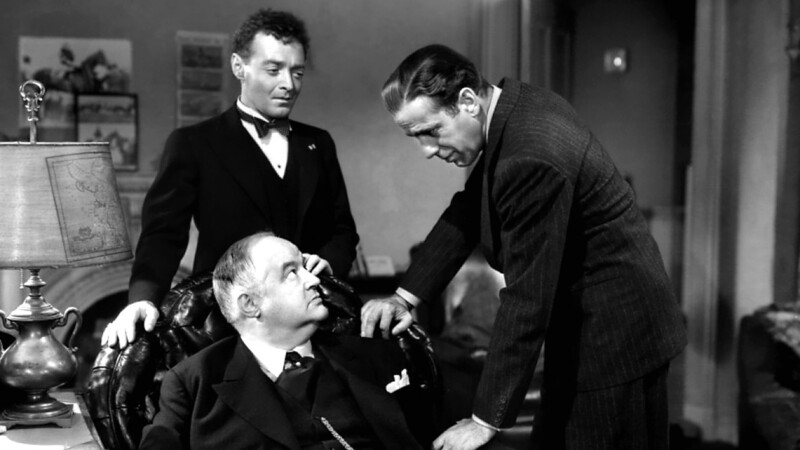 Love ‘The Maltese Falcon’, anything with Peter Lorre is always worth watching, (‘M’) and Greenstreet almost steals the film towards the end (for me). I also agree that Sam Spade is far more satisfactory as a character than Marlowe, although Robert Mitchum seems to have captured the feel of Marlowe better, when he played him in the 70’s. Wonderful stills again Niall, so complimentary to the article. Well done mate. If you like Cagney as a straight actor, check him out as a song and dance man, (where he started) in ‘Yankee Doodle Dandy’. A different side to him. cheers donald. christ, haven’t seen ‘key largo’ in ages; thanks for reminding me of it. great film. cheers, pete. i just submitted a review of the 1934 ‘The Man Who Knew Too Much’ with Peter Lorre. I’m not too fond of the Mitchum Marlowe: I think you’re right that maybe he caught the character better, but the films themselves are a bit dodgy, perhaps because they updated the story (I vaguely recall one was set in England for some reason and co-starred the queen of tatty 1970s trash, Joan Collins). I think it was done by Michael Winner. Regards from England, (also very old) Pete. indeed. did winner ever make a decent film? Hey, my review is one of the related articles. Sweet. 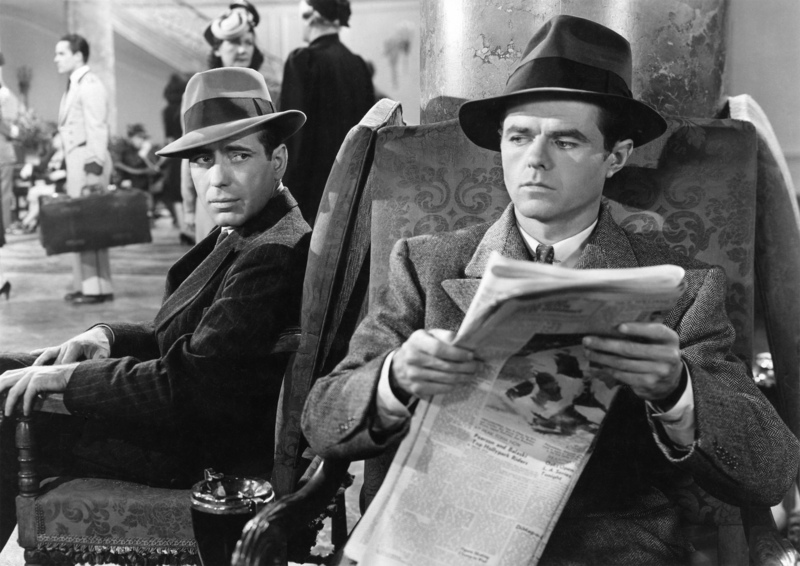 That brings back memories – “The Maltese Falcon” was the first film we discussed in my first adaptation class, so many years ago 🙂 Nice review! I watched this just the other night. First time I’d ever seen it. I enjoyed the over use of low angles, the cynicism of the actors and the hustle of pace of the plot, even if falling in love takes a blink. I especially enjoyed the end moments, the oh well sorry to trouble you, are you with me or against me. Much simpler.